On the outside looking in, Metals & Services Co. appears like any other steel-service center, ready to load plate, bar and other products onto a truck for delivery to local fabricators. But from the inside looking out, this is not the typical service center. While others may offer a taste of value-added services, Metals & Services lays out the full buffet, offering an array of processing capabilities including plasma, laser and waterjet cutting, bar and plate sawing, welding, shearing, bar edging, polishing and even pre-assembly kits. Its most recent addition is a 3-kW fiber-laser cutting machine, and a 250-ton 12-ft. press brake will make its way to the Addison, IL, shop later in 2017. 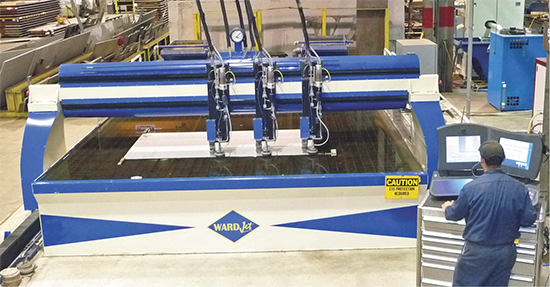 Metals & Services Co. operates three of these three-headed WardJet waterjet-cutting machines 20 hr./day over three shifts. Using common control platforms among all three machines maximizes scheduling flexibility, according to waterjet coordinator Steve Herff. But the centerpiece of the 135,000-sq.-ft. shop is its trio of three-headed waterjet-cutting machines, all WardJet models. The largest of the three, and also the newest (added in 2015), features a 166- by 253-in. cutting table. The others cut on tables measuring 132 by 313 in., and 140 by 187 in. The firm’s customer base, notes sales executive Jayne Baessler, comprises heavy users of stainless steel—wastewater-treatment facilities, pharmaceutical manufacturers, food processors and the like. Keeping the waterjet work flowing through Metals & Services falls on waterjet coordinator Steve Herff. “Often, the customer will specify which cutting process—laser, plasma or waterjet—they prefer,” he says. “If not, we decide, based on tolerances, speed and cost. Typically, though, parts that will be machined after cutting can be plasma-cut. But if the profile is the finished product, then we opt for laser or waterjet. 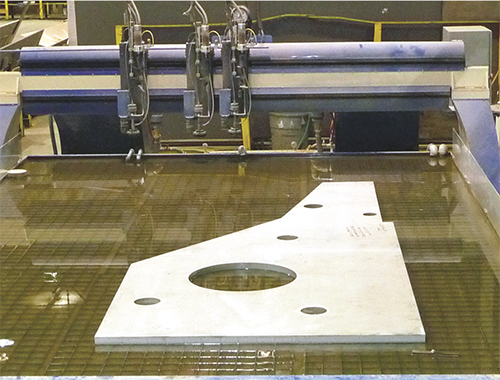 The workhorse waterjet machines make thousands of inches of cuts in stainless-steel plate as thick as 6 in. week in and week out. “We’ve outfitted all of them to be powerful and large—we don’t ever want to be limited in what we can process,” says Pete Fagan, Metals & Services Co. general manager. “We specifically looked for powerful pumps to drive the three cutting heads (on each machine), without sacrificing cutting speed and quality.” The pumps of choice are Hypertherm HyPrecision 150D models, 60,000-psi dual-intensifier pumps equipped with 150-hp motors and featuring several notable control functions designed to optimize ease of use. A high-profile job completed recently by the service center had it cutting ¾-in. stainless plate for Omaha, NE, fabricator Puritan Manufacturing, contracted to build a massive 55,000-lb. sculpture for the University of Nebraska’s sports arena. The sculpture, describes Herff, combined two-side-polished plate with holes cut in some sections through which polished tubes were to be inserted. The trio of waterjet machines are true workhorses. The shop typically runs 50-mesh garnet, suitable for nearly all of its stainless-steel plate-cutting work. For particularly thin-gauge sheetmetal and more precise cuts, it’s equipped one of the three machines with dual garnet hoppers. The pumps of choice are Hypertherm HyPrecision 150D models, 60,000-psi dual-intensifier pumps rated for a maximum orifice diameter of 0.025 in. They’re equipped with 150-hp motors and feature several notable control functions designed to optimize ease of use. These include what Hypertherm calls advanced intensifier monitoring, for early detection of leakage; an enhanced maintenance interface along with a web-based interface for remote access to system and maintenance performance; and control of intensifier settings during pump operation. What Herff and the team settled on, after its due diligence, was an Extractor garnet-removal system. “One hose, moved around the table, even during cutting, by an operator pulls water and garnet out of the machine, while another hose recycles the water back—stirring the water and garnet around so that there is no sediment left in the machine,” Herff says. “In a couple of hours, the Extractor is full—we just use a forklift to raise it up over a dumpster to empty it; no special disposal requirements. See also: WardJet, Inc., Hypertherm, Inc. There are no comments posted at this time. * Indicates field is required.